The Republic of the Philippines is one of the South East Asian countries, composed of around 7,107 islands with a land area of approximately 30 Million hectares and lying north of the Equator with the (South China Sea), now known as west Philippine Sea on the west and the Pacific Ocean on the east. Specifically, it is scattered within 4 degrees to 22 degrees N Latitudes and 116 degrees to 127 degrees E Longitudes. Subject to territorial dispute, it extends up to 112 degrees Longitude, considering that the exact location of Pag-asa Island, Kalayaan, Palawan, Philippines is at 11 degrees, 3 minutes N latitude and 114 degrees, 17 minutes E Longitude. There are three (3) major groups of islands namely: Luzon, Visayas and Mindanao. Largest group of islands is Luzon with an area of around 13,900,041 hectares followed by Mindanao with around 10,671,365 hectares and Visayas with an approximate area of 5,662,632 hectares. The exact land area of the Philippines shall be provided upon the completion of the Cadastral Surveys in 2016. Of the total number of islands, there are 7,086 islands containing an area of only 5 sq. kms. & below and roughly 21 islands have an area of 500 sq. kms. & above. The highest peak is Mt. Apo in Davao, Mindanao with an elevation of 2,954 meters (9,692 feet), above mean sea level. The climate is tropical with an average temperature of 27°C and humidity of about 75%. There are two distinct seasons, the dry and the wet. The rainy months starts from June to October when the southwest monsoon brings the rains. The deepest (lowest) in elevation is Galathea depth, Philippine trench at 10,540 meters (34,580 feet). It is the third deepest in the world after the Challenger Deep of Marianas trench at 10,971 meters (35,994 feet) and the Tonga trench with 10,882 meters (35,702 feet). The longest mountain range is the Sierra Madre Mountains in Luzon with a length of about 500 kms., stretching from the northeast portion of Cagayan province down to the southern portion of Quezon province. The country has 2,229,438 square kilometers of territorial waters that is rich in marine life, and has 31,370 kms of coastline. The terrain is mostly mountainous with narrow to extensive coastal lowlands. Out of the approximately 30,000,000 hectares land area of the country, 53% or 15,900,000 hectares more or less are forest lands, national parks & mineral lands, while 47% or around 14,100,000 hectares are alienable and disposable lands (A&D). The total population as of 2010 as per records of the Philippine Statistics Authority is 92,335,113, composed of several Malayan Ethnic Groups, with significant number of mixed racial ancestry such as Spanish, Chinese, and Caucasian. There is a heavy concentration of population in urban areas, majority of which are in Luzon. Urban population is 41,855,571 while the rural population is 50,479,542. The projected total population this year is 101,562,300 (Million Filipinos). Likewise, the total population of the Philippines shall be provided after the completion of an official count or survey of population currently being undertaken, early this year by the government. Aborigines reached the Philippines thru land bridges from the Malay Peninsula. Indonesian followed by Malaysian reached the Philippines by boat. Spanish colonizer reached the Philippines in 1521. However, several hundred years before them, Chinese traders were already visiting the archipelago. The Laguna Copperplate Inscription (LCI) is the first written document found in a Philippine language. The inscription itself identifies the date of its creation as the year 900. Prior to its discovery in 1989, the earliest record of the Philippine Islands corresponded with the arrival of Ferdinand Magellan in 1521. The discovery of the LCI thus extended the record of Philippine history back by 600 years. After 900, the early history of territories and nation-states prior to being present-day Philippines is known through archeological findings and records of contacts with other civilizations such as Song Dynasty China and the Bruneian Empire. In 1989, Antoon Postma deciphered the text of the Laguna Copperplate Inscription at the National Museum of the Philippines and discovered that it identified the date of its creation as the "Year of Syaka 822, month of Vaisakha." According to Jyotisha (Hindu astronomy), this corresponded with the year 900 A.D. Prior to the deciphering of the LCI, Philippine history was traditionally considered to begin in 1521, with the arrival of Magellan and his chronicler, Antonio Pigafetta. History could not be derived from pre-colonial records because such records typically did not survive: most of the writing was done on perishable bamboo or leaves. Because the deciphering of the LCI made it out to be the earliest written record of the islands that would later become the Philippines, the LCI reset the traditional boundaries between Philippine history and prehistory, placing the demarcation line 600 years earlier. The inscription forgives the descendants of Namwaran from a debt of 926.4 grams of gold, and is granted by the chief of Tondo (an area in Manila) and the authorities of Paila, Binwangan and Pulilan , which are all located in Luzon The words are a mixture of Sanskrit, Old Malay, Old Javanese and Old Tagalog. The subject matter proves that a developed society existed in the Philippines prior to the Spanish colonization, as well as refuting earlier claims of the Philippines being a cultural isolate in Asia; the references to the Chief of Medang Kingdom in Indonesia imply that there were cultural and trade links with empires and territories in other parts of Maritime Southeast Asia, particularly Srivijaya . Thus, aside from clearly indicating the presence of writing and of written records at the time, the LCI effectively links the cultural developments in the Philippines at the time with the growth of a thalassocratic civilization in Southeast Asia. Around the year 1500 AD, the Kingdom of Brunei under Sultan Bolkiah attacked the kingdom of Tondo and established a city with the Malay name of Selurong (later to become the city of Maynila) on the opposite bank of Pasig River. The traditional Rajahs of Tondo, the Lakandula, retained their titles and property but the real political power came to reside in the House of Soliman, the Rajahs of Manila. Filipino historians note an overlap in the history of pre-colonial Philippines and the Spanish colonial period, noting that while Magellan's arrival in 1521 marked the first arrival of European colonizers to this country, it was not until the arrival of Miguel Lopez de Legaspi in 1565 that the Europeans had any marked impact on the lifestyle of the residents of the Philippine Archipelago. According to National Historical Institute and National Commission for Culture and the Arts Chair Ambeth Ocampo, “the so-called Spanish period in Philippine history does not begin with Magellan’s arrival in Cebu and his well-deserved death in the Battle of Mactan in 1521. Magellan may have planted a cross and left the Santo Niño with the wife of Humabon, but that was not a real (conquista) conquest”. The American Government placed the Philippines under its colonial rule in 1898 thru the Treaty of Paris wherein the Spanish government transferred its authority over the Philippines to the Americans. The Philippines became a member of the Commonwealth and at the end of World War II, was granted Political Independence by the American government, although at present, the officially recognized date of Philippine Independence is June 12, 1898. There are three (3) major branches of the government namely, the Executive headed by the President, the Judiciary – the Supreme Court headed by the Chief Justice and the Legislative – the Congress composed of the Senate and the House of Representatives. The President is elected by popular vote. Senators, like the President seeks mandate from the majority of voting population in the entire country every six (6) years while the members of the House of Representatives are elected by Districts every three (3) years. There are eighty (80) provinces, one hundred thirty eight (138) Cities, one thousand four hundred ninety six (1,496) municipalities and forty two thousand, twenty five (42,025) Villages (barangays). The provinces are headed by governors, the municipalities and cities by mayors, and barrios (barangays) by chairmen, all are elected by popular votes, every three (3) years. At present, the Archipelagic Republic of the Philippines is divided into Eighteen (18) regions. Most national government offices are established by regions, usually in a city designated as the Regional Center. Some of the region designations include numeric components, some with a combination of alpha numeric, like CALABARZON (Region 4-A), MIMAROPA (Region 4-B) and SOCCSKSARGEN (Region 12). These are capitalized because they are acronyms that stand for their respective component provinces or cities. CALABARZON and MIMAROPA were previously together known as Region 4, until they were separated on May 17, 2002 by virtue of Executive Order No. 103 issued by then President Gloria M. Arroyo. CALABARZON or Region 4-A is the acronym of the provinces of Cavite, Laguna, Batangas, Rizal and Quezon. This is the most populated region in the Philippines as of 2010. MIMAROPA or Region 4-B on the other hand is likewise the acronym of the five provinces within its jurisdiction composed of: Occidental Mindoro, Oriental Mindoro, Marinduque, Romblon and Palawan. SOCCSKSARGEN stands for the provinces of South Cotabato, Cotabato, Sultan Kudarat, Sarangani and General Santos. The Autonomous Region in Muslim Mindanao (ARMM) has an elected Regional assembly and a Governor, while the Cordillera Administrative Region (CAR) was originally intended to be autonomous, but the failure of two plebiscites for its establishment reduced it to a regular administrative region. The current national leadership headed by President Benigno S. Aquino III is pushing for the approval of the Bangsamoro Basic Law (BBL) which is presently being deliberated in Congress to replace the ARMM, aimed at solving the armed conflicts in Mindanao. Regions first came into existence on September 24, 1972, when former President Ferdinand E. Marcos issued Presidential Decree No. 1 as part of the Integrated Reorganization Plan, wherein the provinces of the country were organized into eleven (11) regions. From thereon, other regions were created and in some cases, several provinces were transferred from one region to another. The Judiciary, specifically the first and second level courts are similar, in so far as its regionalization is concerned with that of the administrative regions in the executive branch of government, as provided for by Batas Pambansa bilang 129, otherwise known as “The Judiciary Reorganization Act of 1980”. The Cadastral survey program in the Philippines may be said to have its beginning as early as 1903 when the American Civil Government in the Philippines purchased in 1902, some 410,000 hectares of friar lands and had them surveyed and allocated to the occupants under a scheme of agrarian reform. In order to expedite public land distribution, then Director of Lands Chas H. Sleeper introduced cadastral surveying, but the actual inauguration of cadastral survey projects under the present numbering system begun in November, 1909 with the first project numbered as Cadastral Project No. 1, covering the town of Pilar, Province of Bataan. Director Sleeper established the first Surveying School in Manila High School (MHS) sometime in 1908 to train Filipino surveyors. It was later transferred to the Philippine School of Arts and Trades (PSAT). In 1925, then Bureau of Lands Director Jose B. Vargas transferred the Surveying School of the Bureau to the University of the Philippines (UP), College of Engineering. American surveyors exclusively conducted the cadastral survey from 1909 to 1915. The participation of American surveyors was gradually reduced, until in 1921 when the execution of land surveys was all done by Filipino surveyors. The formalization of the cadastral survey program took shape with the passage of Cadastral Act No. 2259, on February 11, 1913. This has become the formal mandate that authorized the Director of Lands to conduct cadastral surveys. The first Filipino to head the Bureau of Lands was the former revolutionary general, Gen. Manuel Tinio who held office from 1913 - 1914. Act 2259, provided the mechanism for the compulsory registration of all landholdings covered by cadastral survey. Land titling thru Torrens System is the primary objective of the cadastral survey. The main output is a line map and the metes and bounds of each parcel surveyed and other data that relate to land ownership or land tenure. Before the start of the war, the then Bureau of Lands was able to issue a total of 93,694 patents and had conducted a total of 289 cadastral surveys, the last being Cad – 289 in Manay, Davao Oriental for judicial titling. In 1992, with the passage of Republic Act No. 7160, also known as the Local Government Code of 1991, the functions to conduct cadastral surveys, lot surveys, isolated and special surveys were among the functions of the Department of Environment and Natural Resources (DENR) that were devolved to the local government units (LGUs). Nearly ten years later, in 2001, it was found out that not a single municipality had initiated its cadastral survey due to lack of technical manpower and financial resources of the LGUs. This prompted the DENR, during the stewardship of former Secretary Heherson T. Alvarez upon the recommendation of then Lands Management Bureau Director Concordio D. Zuniga to get back from the LGUs, the devolved functions to execute, supervise and manage land surveys, through DENR Administrative Order No. 2001-23, dated August 29, 2001. From thereon, DENR became more aggressive in its desire to complete the cadastral survey of the country by requesting congress to allot more funds in this particular activity, hence, the cadastral survey program gained momentum. In the Philippines, the Department of Environment and Natural Resources (DENR) thru the Lands Management Bureau / DENR regional offices, is mandated to administer and manage public lands, government owned lands and all other lands not placed under other government agencies by virtue of Commonwealth Act 141, as amended, otherwise known as the Public Land Act, Cadastral Act 2259, Republic Act No. 6657 otherwise known as Comprehensive Agrarian Reform Law. There are two (2) processes of acquiring title, one is judicial and the other is administrative. In judicial titling there are two (2) proceedings, one is ordinary judicial proceeding which is governed by Property Registration Decree, Presidential Decree 1529 and the cadastral proceedings which is governed by the Cadastral Act, Act 2259. In both cases, it is the Court that issues order of registration. In the administrative process, the disposition of lands by administrative titling is vested in the DENR Secretary through the Director of Lands as per Commonwealth Act No. 141, as amended, otherwise known as the Public Land Act. With the promulgation of Executive Order 192, during the freedom constitution of then Pres. Corazon Aquino, the Department of Energy, Environment & Natural Resources was reorganized and renamed it as DENR on June 10, 1987. With this development, administrative land titling was delegated to the Regional Executive Directors, now DENR Regional Directors and the Provincial Environment and Natural Resources Officers (PENROs), depending on the land area involved. With the aforementioned systems, therefore, there are five (5) government agencies involved in surveying, mapping and land titling activities, namely, DENR, Department of Agrarian Reform (DAR), Land Registration Authority (LRA), National Commission on Indigenous Peoples (NCIP) all through Administrative titling, and the Judicial Court, Regional Trial Court (RTC) and/or the Municipal Trial Court (MTC) for Cadastral proceedings. When the Integrated Reorganization Plan was fully implemented in the early part of 1970s, cadastral proceedings were totally stopped. Land patents of all cadastral survey projects were all issued by the DENR. The Cadastral Survey Projects in its earlier years were executed solely by the Bureau of Lands surveyors. However, with the passage of Act 2989 which allowed private surveyors to undertake cadastral projects upon assignment by the Bureau of Lands, cadastral survey program was accelerated. The law was amended by Act 3327 which authorized private cadastral surveyors to negotiate cadastral surveys with the local government units concerned but with the technical supervision being provided for by the then Bureau of Lands. Surveyors, now known as Geodetic Engineers, are organized into a professional organization called "Geodetic Engineers of the Philippines, Inc." (GEP), comprising of more than five thousand (5,000) geodetic engineers. In 2003, there were more than 5,000 Geodetic Engineers and a little above 7,000 Junior Geodetic Engineers. However, the new geodetic engineering law (Republic Act No.8560) and its implementing rules and regulations require the updating or to finish the five-year course in college for all registered Junior Geodetic Engineers so that they can be registered as full-fledged Geodetic Engineers. With this development, there were only 785 Junior Geodetic Engineers who upgraded/updated their profession, hence, the tremendous decrease in the number of duly registered geodetic engineers. They are grouped into Regional and Provincial Chapters. Annual assemblies are also being held and grouped as North Luzon Area Assembly, South Luzon Area Assembly, Visayas Area Assembly and Mindanao Area Assembly. Furthermore, annual national convention is also being held wherein the Board of Governors are elected by the members and in turn, the Board of Governors elect from among themselves their GEP National Officials. A representative of the GEP National Board sits as one of the members of the Bidding and Award Committee during the conduct of the Cadastral Survey project bidding. This is to ensure that there will be impartiality among members of the Committee in the conduct of the bidding process; that the technical requirements are of the highest standard possible; and that the price of the project is reasonable; etc. The GEP national board is represented by the Regional President of the GEP, or his duly authorized representative in the public bidding of all cadastral survey projects in the regional offices of the DENR, as observers. The GEP was admitted and registered as a member of FIG during the incumbency of then DENR Lands Management Bureau Director Concordio D. Zuñiga as National President of GEP in 1993-1994 but was delisted for non-payment of dues when he was no longer the National President. It was only in 2008 when GEP was readmitted to FIG after payment of the required membership dues. The Professional Regulatory Board of Geodetic Engineering (PRBGE) under the Professional Regulation Commission (PRC) is tasked to give examinations to aspiring geodetic engineers. Based on the approved table of specifications (TOS), there are five (5) subjects covered by the licensure examination, to wit: Laws, Rules and Regulations, Mathematics, Theory and Practice in Surveying, Geodesy and Cartography. Competency in laws rules and regulations include the following: Public land laws, laws on property, laws on natural resources, land registration law, land reform law, obligation and contract, professional and ethical practice, and rules and regulations governing land surveys. Mathematics covers the following subjects: Algebra, solid geometry, analytical geometry, engineering economics, plane and spherical trigonometry, differential and integral calculus. The coverage of Theory and practice of surveying are as follows: Plane surveying, Isolated surveys, mineral, cadastral, astronomy, railroad curves and earthworks/hydrographic/topographic, and photogrammetry. Competency in Geodesy on the other hand, include subjects like: Geodetic surveying, geodetic astronomy, geodetic triangulation, geodetic leveling, gravity measurement, and map projection; and Cartography includes the following subjects: plotting and mapping of Isolated, mineral and cadastral surveys, solving and analyzing hydrographic, topographic, photogrammetric surveying, and practical problems. The examination is held every month of August but this year, it was moved to October due to some requests from universities offering Geodetic Engineering courses because of the change of academic year from June to August. In order to be eligible to take the examination, an applicant must be a holder of Bachelor’s degree in Geodetic Engineering. Bachelor of Science in Geodetic Engineering (BSGE) as a five (5) year-course, is offered by twenty nine (29) universities: seventeen (17) in Luzon including Metro Manila, five (5) in Visayas and seven (7) in Mindanao. Annually, there are about three hundred fifty (350) to four hundred (400) students graduating in the course and around four hundred (400)graduates, including repeaters take the Board Examination with an average of thirty seven (37%) percent passing rate. About three (3) out of ten (10) students are women out of the total enrolment of three thousand, five hundred twenty five (3,525) as of July, 2015. The University of the Philippines reported that 50% of their enrollees are women. Around forty percent (40%) nationwide are working students. BSGE as a five (5) year course, is offered by only eight (8) universities: two (2) in Northern Luzon, one (1) in Central Luzon, two (2) in the Metro Manila, one (1) in Bicol Region, one (1) in Visayas and one (1) in Mindanao. Annually, less than one hundred (100) students are graduating in the course and around half are able to pass the Board Exam. The course, basically includes the following subject: plain surveying, geodetic surveying, laws on natural resources, land laws, mathematics, astronomy, cartography, photogrammetry, cadastral surveying, lithography, least squares, hydrography, route surveying, mining surveying, land use planning, photo-interpretation, gravimetry, remote sensing, satellites surveying and computer science. Mathematics subjects are scattered from first year to fifth year, from algebra to calculus and matrix. Only three (3) out of ten (10) students are women and around forty percent (40%) are working students. The Cadastral Survey in the Philippines is a survey made of extensive areas covering an entire municipality or city consisting of several or many parcels of land undertaken for the purpose of title clearance and land registration. Cadastral Act No. 2259 which govern Cadastral Survey, is intended primarily for the purpose of quieting title to any land within a particular area by way of compulsory registration proceedings and thus minimize land conflicts. The owners of lots surveyed must lay claim to their land holdings and must prove their ownership during the subsequent court proceedings because failure on their part to do so may give the court no choice but to declare these lands as public lands. Some of the benefits that may result upon the completion of the Cadastral Survey in the area include: agricultural development; comprehensive and accurate data on land resources of the country; facilitate land disposition to qualified public land applicants; delineation of the boundaries of all political units/subdivisions of the country as basis of a more accurate Internal Revenue Allotment (IRA) for local government units; provide economic data for land-based development studies; and provide map-based data for zoning, land use programming, and a more reliable tax mapping. There are two (2) types of Cadastral System in the Philippines, one is Graphical Cadastre (Fig. 1) and the other is Numerical or Regular Cadastre (Fig. 2). These two (2) systems can be executed either by ground method or by aerial photogrammetry. Basically, numerical cadastre is associated with surveying while graphical cadastre, with mapping. While the Numerical Cadastre produces bearings and distances of boundary lines of lots with the area up to the hundredths of a meter (derived from computations), the graphical cadastre simply gives the shapes of the lots with the distances of the boundary lines derived from scaling the lines on the maps and the area determined by scaling or planimeter or by templates. 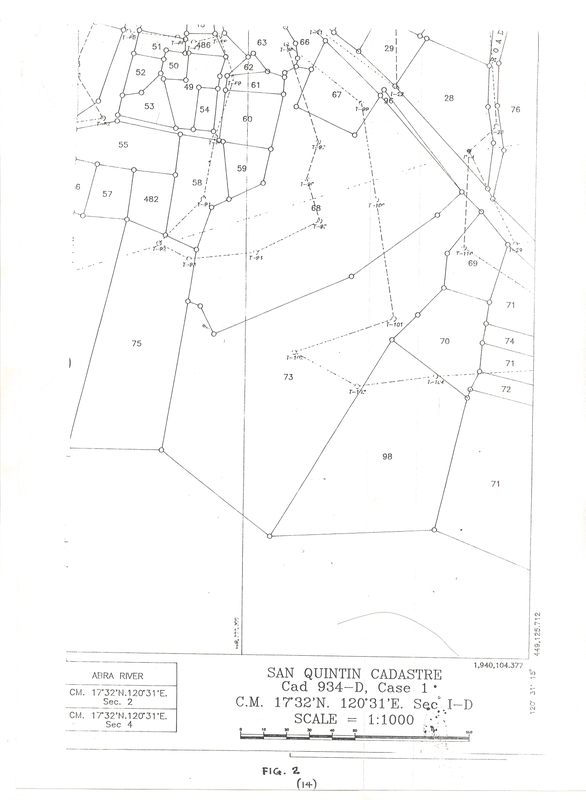 The Graphical Cadastre was discontinued in favour of the more accurate Numerical Cadastre, in the later part of 1970s. The primary objective of the cadastral survey is land titling. Any land use information that are obtained in the process are gathered not for economic development purposes as we perceive them to be at present but for additional information in support of tenure or legal hold. However, data contained in the cadastral maps after its approval, can be used by other government agencies for whatever purpose/s it may serve them. Every parcel of lot in the coverage area of a cadastral survey project is assigned a lot number which shall be done consecutively from number one and without duplication. An assigned lot number in one barangay (barrio) cannot be assigned to a certain lot in another barangay (barrio) of the coverage municipality. The project is divided into cases. The procedure is: one case for every barangay regardless of whether one barangay is less than 1,000 lots or more than 1,000 lots. However, the then Bureau of Lands, realizing the urgency of the need to finish soonest possible the cadastral survey in the entire country, it resorted to contracting the cadastral projects by Module, wherein one (1) Module consists of one (1) barangay. A municipality with twelve (12) barangays may have twelve (12) cadastral survey module contractors. All the said modules will bear the same Cadastral Survey Number. Category “A” refers to the complete Cadastre. This includes the establishment of project controls, political boundaries, and lot surveys. Category “B” refers to the establishment of project controls and political boundaries. This category refers to a cadastral survey of a municipality which was already cadastrally surveyed in the past, or surveyed under the public land subdivision (Pls) and/or group settlement subdivision (Gss), but with incomplete political boundaries or a new created municipality with new established political unit/s for internal revenue allotment (IRA) purposes. Category “C” This category of cadastral survey is purely surveying the un-surveyed portion of previously approved cadastral survey projects, or in some cases newly released alienable and disposable lands within the said cadastre, surveyed lot by lot as claimed by qualified public land applicants. As per records of the Lands Management Bureau, the Aquino government allotted a total of five billion, seven hundred one million, two hundred fifty thousand, nine hundred sixty four (P5,701,250,964.00) pesos, the biggest budget allocation in cadastral survey in the span of one hundred (100) years for a period of five years, from 2010 to 2015 to finish the cadastral survey program in the Philippines. LMB also reported that of the 1,634 cities and municipalities in the Philippines, the DENR Regional offices surveyed 1,516 and the remaining 118 are still being undergoing inspection and verification of its survey returns by the Autonomous Region of Muslim Mindanao. Some of the 1,516 cities and municipalities were formerly cadastrally surveyed but were resurveyed under categories “B” and “C”. The conduct of the cadastral survey were outsourced by DENR using the World Bank Rules and R.A. 9184 and its Implementing Rules and Regulations (IRR); Issued policies and guidelines to ensure transparency, competitiveness and accountability in the procurement of cadastral projects in the regions. Normally, one (1) title covers one (1) lot. However, there are instances that a single title encompasses two (2) or more lots within the same barangay, more often, the said lots are adjoining. The titles contain among others, the name of the owner and other information about him, the tie point, technical description of the lot itself, the metes and bounds, the area, and the adjoining man-made and natural features, etc. 1) Cadastral Maps (CM) indicating individual parcels and their actual geographic position. 13) Miscellaneous data on land surveys, land disposition and titling, occupancy, profiles and other land and survey information needed for planning and for land management purposes. The Cadastral output as listed above is basically composed of textual (non-spatial) data such as Lot Description Books, Lot Data Computation Sheets, List of Claimants, etc. and Spatial Data made up of complex geographic objects including network of lines such as lots, roads, rivers, etc. 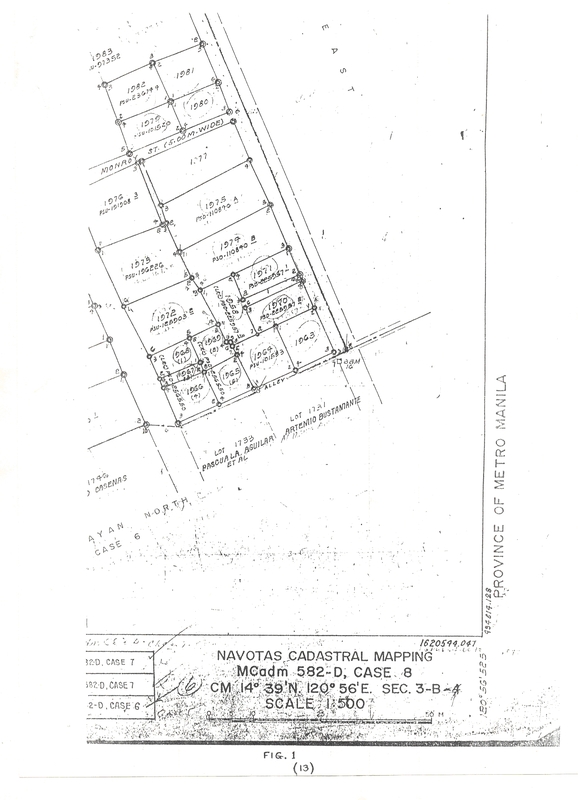 The numbers of concrete monument and the description of lot corners are indicated on the Cadastral maps and also the name of claimants except when space limitation does not permit it. The respective lot numbers are indicated normally, in consecutive and regular order. Forest Lands, Reservations and other unalienable areas are also treated as one lot but with remarks as Forest Land, Military Reservation, etc. The Cadastral maps also show the names of all claimants adjoining the projects boundaries as well as the lines between the adjoining claims which are drawn in dash lines. Adjoining approved surveys are indicated by the lot and the corresponding survey number and name of claimant. Local names of natural features such as mountains and all bodies of waters such as rivers, esteros, arroyos, etc. are indicated on the Cadastral Maps. The names of barangays (barrios) are also indicated within their respective boundaries. Easements are indicated either three (3), twenty (20), or forty (40) meters depending on the classification of land. When Cadastral lot is equivalent to a previously approved survey, both the cadastral number and the number of previously approved survey are indicated. Grid lines and plane coordinates, graticule lines and geographic coordinates, survey control stations and traverse lines, political boundaries and monuments and Reference/Location Monuments are also indicated. All lands within a Cadastral Survey Project, in the absence of titles are presumed public lands. For this reason, all claims therein are contestable by the government. During the Cadastral hearing, the Director of Lands, as representative of the Government sees to it that land rights are properly settled and adjudicated, should a claimant fail to prove his claim, the land will be declared public by the court in accordance with the claim of the government. It is for this reason that during the conduct of survey, all owners of properties, titled or not, cannot refuse to have their lands surveyed. Cadastral proceeding is a judicial proceeding because it is in the court that land titles are settled and adjudicated. It is in rem, because it is instituted against the whole world to bar indefinitely all those who might be minded to make objections of any sort against the right sought to be established, that is, the title to the property. ARMM is composed of five (5) provinces; two (2) cities; one hundred sixteen (116) municipalities and two thousand four hundred ninety (2,490) barangays (barrios). Of the 60 projects with an estimated area of 1,157,261 hectares, 57 are now undergoing field survey works and three (3) projects are undergoing office verification and the remaining 58 with an estimated area of 1,767,838 hectares are still to be surveyed. Please refer to the pie chart below. The remaining seven hundred sixty-three (763) cities/municipalities of the total universe of 1,516 cities and municipalities (except ARMM) will be completed during the term of President Aquino. Partially surveyed municipalities have a previously approved public land subdivision, group settlement survey, and/or townsite reservation subdivision. The said surveys cover only certain portion of the city or municipality, unlike the Cadastral Survey which encompasses the entire municipality. Cadastral lots and other details of the cadastral surveys are plotted on reproducible materials such as drafting film 0.003 inch with polyster or mylar encompassing areas within spheroidal quadrangle of one minute of arc in latitude and one minute of arc in longitude (approximately 1.8 km by 1.8 km) and drawn in the Philippine Plane Coordinate System Philippine Reference System of 1992 (PPCS-PRS92). Cadastral Map sheets are approximately 54 by 54 centimeters in size and carry a standard scale of 1:4,000. Sectional Cadastral Maps are drawn on larger scale such as 1:2,000; 1:1,000; 1:500; on the same size as the standard cadastral maps to show tracts of land which appears too small on the standard scale of 1:4,000. These lots are usually residential lots in the poblacion (town proper). Contiguous Cadastral Maps (CCM) on a smaller scale of 1:8,000 or 1:16,000, show parcels of lands which are too big to be contained on the standard scale of 1:4,000. These lots are forestlands, reservations and big undivided land holdings consisting of hundreds or thousands of hectares within a municipality. All public lands within cadastral projects are shown on the cadastral maps with separate lot numbers. Previously approved surveys are also shown with their respective survey numbers and equivalent cadastral lot number and with corresponding remark either “Accepted”, “Amended”, or “Rejected”. Cadastral maps are being used as projection maps in the different DENR Regional Offices which enable them to be periodically updated. However, there are Cadastral Maps which are incomplete, especially those pre-war Cadastral Surveys, and therefore, not being updated. The DENR Regional Offices uses blank 54 x 54 cm. tracing paper as projection maps in lieu of the Cadastral Maps. Fig. 1: Graphical Cadastral Map. Attached herewith are examples of two (2) types of Cadastral Maps, Figure 1, shows the graphical Cadastral Map, Cadastral Mapping (symbol: Cadm), and Figure 2, shows the numerical (regular) Cadastral Survey Map (symbol: Cad). In Cadmapping, the survey control is executed on the ground but the lot corners are determined by plane table and alidade or transit and stadia. The area is graphically estimated. The Regular Cadastre calls for accurate survey and therefore, the survey control points and all lot corners are directly observed. Lot area is determined by computation. Fig. 2: Numerical Cadastral Map. Promotion of social development and social justice. Improvement of habitat through development of human settlements and proper management of environment. Accelerated regional development especially the rural areas. Attainment of self-sufficiency in food and greater self-reliance in energy. Maintenance of internal security and harmonious international relations. To provide comprehensive and accurate data on land resources of the country. To accelerate settlement and adjudication of land titles. To facilitate and accelerate public land management and disposition. To provide a basis for an integrated tax mapping system and land evaluation. To provide an effective base to accelerate the land use and classification for socialized housing programs. To delineate the boundaries of all political subdivisions in the country. To provide economic data for land based developmental studies and projects. To provide mapping basis for land zoning and land use programming. In spite of the introduction of computers in the operation of several government activities, the retrieving, updating and tracking of Cadastral Maps and other data are being done manually. The land sector through the years has experienced remarkable increase in clientele and in number of records to manage. However, it cannot cope with this situation due to several reasons such as funding constraints, existing auditing rules and regulations, lack of manpower, etc. This was aggravated by inadequate space, poor storage facilities and frequent transfer of offices. Fire and natural calamities such as floods also contributed to the lost and damage of valuable records and documents. Proliferation of fake survey plans and land titles, are becoming a problem of the government. The absence of reference data from Cadastre on file with the Lands Management Bureau (LMB)/Regional Lands Management Services (LMS) make it harder to detect such spurious documents. Survey plans, lot area computation sheets, technical descriptions, etc. are not issued Memorandum Receipt (MR) to employees unlike chairs, tables, typewriters, etc. making it vulnerable to pilferage. Several projects are being eyed by the government to address the above-noted problems such as Land Records Management and Information System (LRMIS) and Land Administration and Management Project (LAMP). Their aim, among others, is to automate land records. The Land/Cadastral data/information can be shared with other government offices as well as the requesting public as quickly as possible. The system can be used in expediting processing of documents and verification and approval of public land application and subsequent subdivision/consolidation surveys. The documents/maps can be reproduced as many as required copies at instant wherein the files will be free from incidence of tampering, mishandling or even losses. The documents, data and spatial images can be sort, retrieve and tract easily as the need arises. Digital Spatial and textual data can reduce the storage space requirement of voluminous documents such as maps and other survey returns to just 30%. 1.Act 2259 otherwise known as Cadastral Act. 2.DENR Administrative Order No. 98-12, the Revised Manual of Land Surveying Regulations in the Philippines.